Might Apple Bring Back the eMac? How Much Would You Pay For a Computer That Can Run Mac OS X and Windows Vista? I really do hope somebody at Apple is watching Low End Mac - I want one of these! At $299, Apple would own the low end - especially if they could bundle an OEM copy of Windows XP or Vista for an extra $99. At $399, they would make a big impact on Dell, Gateway, and the rest. At $499, the price of the original Mac mini, they would sell enough to increase the percentage of desktop vs. notebook sales, and a lot of Mac users would upgrade from old G3 and G4 models. I envision a 7" cube (a shape we know Steve Jobs loves) with an internal power supply (unlike the Cube or Mac mini), two 3.5" drive bays, four memory sockets, and two PCI Express slots. It would have integrated graphics, 1 GB of RAM, and include a 16x dual-layer SuperDrive. There would be two FireWire 400 ports, one eSATA port, and four USB 2.0 ports on the back, two more on the front, and an iPod dock on top. Bluetooth would be standard, and AirPort Extreme optional. Like the Mac mini, it need not include a mouse and keyboard. Build-to-order options could include larger hard drives, a second hard drive, the same video cards offered with the Mac Pro, up to 4 GB of RAM, and cost cutting options like a smaller hard drive (or perhaps none at all) and swapping a CD-ROM or Combo drive for the SuperDrive. I'd say $399 would be the perfect price, with most buyers adding a mouse and keyboard, a fair number opting for a real video card, and a good number buying an AirPort Extreme card. After reading the article about no more Mac mini, and possibly dropping the 17" from the iMac line, what would the possibilities be if the they redesign the iMacs and keep the 17" form factor the same but rename it as the eMac. The 17" low-end iMac is what replaced the eMac originally, and that would leave a low priced Mac for schools and new buyers. Just some thoughts. I don't expect Apple to ever bring back the eMac name, and if the low-end 17" model is like an iMac in all respects except for screen size, it would only confuse the market not to call it an iMac. I got a 300 MHz educational model of the blue and white "Yosemite" G3 today from a seller on eBay, and it had all of the Revision 2 embellishments, including the redesigned heatsink, better hard disk mounting bracket, and the 402 IDE controller. Yet it had a Rage Pro graphics card with the old style Mac connector and S-video/composite video port, not the Rage 128 with VGA as on the mainstream models. And yes, I did check System Profiler, and it was 300 MHz even. You may have other experiences, but it seems weird that someone would put a 300 MHz processor in a Revision 2 case and logic board. And it even backs up my findings on the back of the case, in the genuine Apple sticker. We've never paid close attention to what differentiates education-only models from mainstream Macs. I'd guess that this unit may have had the motherboard replaced, as I haven't heard of a 300 MHz b&w shipping from the factory with a Rev. 2 motherboard. The keyboard has a split space bar with an extra key in the middle that I suspect is the mouse button. If you look at the picture closely (the second one down on the right in your article), you'll see that it has a normal space bar, and below that are what appears to be two mouse buttons with what sort-kinda looks like a possible scroll wheel type device in the middle. Thanks for writing. More recent articles I've read about the Foleo mention a scrollwheel. That's probably what it is. I don't know how the Foleo could succeed. 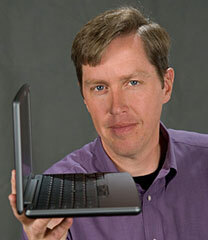 The American market has continually wanted powerful, compatible notebook computers. The Windows CE machines that were of the subnotebook form factor were not successful. If it can't run Vista or OS X, I don't think that the market will accept it. With Treos and Blackberrys, the palm form-factor demands a radically different user interface, but with a reasonable size screen and a full size keyboard, I think the market would expect more. I can't predict whether the Foleo will be the breakthrough subnotebook Palm hopes for or just another casualty. I think Palm's scheme of marketing it as a smartphone accessory probably dooms it. For the most part, the Foleo makes me wonder what Apple could do in this space with a small, lightweight MacBook designed to complement (rather than replace) your desktop Mac. Nice photos of this unit. I've been wondering when someone is going to help themselves to Apple's nifty laptop hinge that they pioneered on the original iBooks and perfected on their current range. Well, it appears now. Nice tidy little 'business persons Internet appliance' though. You have a good eye. I hadn't noticed the similarity between the Foleo's hinges and what Apple has been using since the dual USB iBook G3 of May 2001. As for the photos, they are PR shots provided by Palm. I looked up the UDMA function of Compact Flash. Found one brand that advertizes it. the Lexar Professional line. However, an 8 GB chip is around 160 dollars on Amazon. So I looked at other solutions. I found this item: A Transcend brand 8 GB IDE [flash] drive< from Newegg.com . it is only $180, and I don't need to buy the adapter. It also seems to have more error protection. Do you think something like this is a good idea? Do you have cheaper brand recommendations that you know are UDMA compatible and relatively fast to use. I would hate myself if I spent a bunch of money to do a flash upgrade and it took me 20 minutes to boot like that poor PowerBook guy. Also, on the issue of my Pismo and PCMCIA. I found two more cards at a friend's house, a smart media adapter and a 10/100 ethernet adapter. They both make a little PC Card icon show up in OS X near the clock on my PowerBook g4, but only the ethernet adapter makes a PC Card icon show up in OS X on the Pismo. The other (now three) card readers do nothing in OS X, and in OS 9 they cause the Finder to crash on the Pismo. So strange. I really have no idea what could cause one card to work and three others to do nothing. Maybe someone on your site will know? Googling for "'compact flash' udma" I came across some information on SanDisk. All current SanDisk cards ship as removable - and SanDisk has a utility that lets the end user change the media bit to be changed to non-removable. I don't know whether this utility works on Macs or for other brands of Compact Flash. Since most CF cards are used in digital cameras or simply for data storage, where it doesn't matter whether the card supports Ultra DMA or not, most vendors don't mention UDMA at all. UDMA is a faster version of the DMA protocol, so I suspect any CF card that supports DMA will work - UDMA ones will just be faster. Transcend notes that their 80x, 120x, 266x, and industrial CF cards all support DMA. PQI doesn't say, but their CF card worked in my PowerBook 1400. While older, slower cards may support DMA, I'm guessing that it's an important factor for high speed cards. In my testing, both high speed cards were bootable, but the older, slower 128 MB and 256 MB cards I had did not. dealram lists 8 GB Transcend 120x CF cards from $89 shipped. That plus the Addonics adapter would set you back about $120 - one-third less than Transcend's IDE flash drive. BTW, I just visited the Addonics site and discovered that they have discontinued the single-card adapter and reduced the price of the dual-card adapter to $25.99. Hi! I enjoyed your review of MDD Dual G4 Processors options. I own an MDD Dual 1.25 G4 with 2 GB RAM and an 80 GB 7200 RPM HD (nearly full; 10 GB remaining) and additional Avid 7200 RPM FireWire HDs. Will $600 for the Sonnet MDX Dual 1.8 Processor Upgrade noticeably help my ProTools system? It runs great now . . . but it is nearly maxed out all the time and occasionally gives up. $1,200 will get me a Dual G5 on eBay but there will be incidentals (RAM, etc.) that will make it more like $1,600; plus the pitfalls of eBay. So the question is: Dual 1.25 G4 MDD vs. Sonnet MDX Dual 1.8. I think the upgrade will require that most of my plug-ins will have to be reauthorized, so this will not be a plug and play. Will I be surprised at the difference? I know you're guessing but your guess is much better than mine and greatly appreciated! P.S. PLAN B: Upgrade the system drive to 10,000 RPM as follows: Add an IDE to SATA adaptor card <http://sewelldirect.com/IDE-to-SerialATA-Converter.asp> then add an external 10,000 RPM 74 GB Raptor Serial Hard Drive (in its own case) for the OS X and ProTools application. This is a tough call. You'll trim maybe 25% from your processing time with the G4 upgrade, as it has no Level 3 cache. And a Power Mac G5 will have far better system throughput because of its very fast memory bus - 1/2 CPU speed vs. 167 MHz (1/7.5 the speed of your 1.25 GHz CPU, and just 1/10.8 the speed of the 1.8 GHz upgrade). The G5 is going to be faster. Bare Feats found a 2 GHz G4 was about 30% faster than a dual 1.8 GHz G4 upgrade in their Photoshop CS-MP Actions test. A 2 GHz G5 will probably be about 65% faster overall than your 1.25 GHz G4 system. And it already has onboard SATA, so no need to buy an adapter. As for reauthorizing plug-ins, you probably won't have to do that with the Sonnet upgrade, since it doesn't change your motherboard - the only advantage I see to upgrading your current Mac.